Saturday was my 32nd birthday. I thought about giving you a list of “32 things on my 32nd birthday”. But I did that two years ago. So instead, I used a little quiet time that my husband gave me on my birthday to finally finish my About Page and give this blog a little makeover for the final weeks of summer. There are new books in the sidebar for me and the girls, and a link to take you directly to my Bushel and Peck posts on Momformation. And thank you to Cassi for featuring my “watercolor blobs” on The Crafty Crow last week. I feel honored to see that little badge in my sidebar because goodness knows I really wanted one! I took away the “good things” links, for now. I’ll freshen them up a bit and bring them back shortly. The About Page is inspired by a post where I asked you all to ask me anything. And boy did you ever! Obviously I couldn’t (and didn’t want to) answer all the questions, but I picked a few of my favorites and answered them as best I could. If my blog traffic takes a downward turn I’ll know that I’ve either completely turned you off with my answers or I’ve told you everything and there’s nothing new you could possibly learn from me at this point. Ha! Ha? Sweet little Mary drew me this picture on my birthday. We sat together out in the yard, me reading a magazine, her drawing beside me. I’d say things to her like, “You forgot eyeballs!” Or “where are everyone’s arms?” and she’d quickly add them in. Apparently this picture is all of us marching through the farmers’ market. 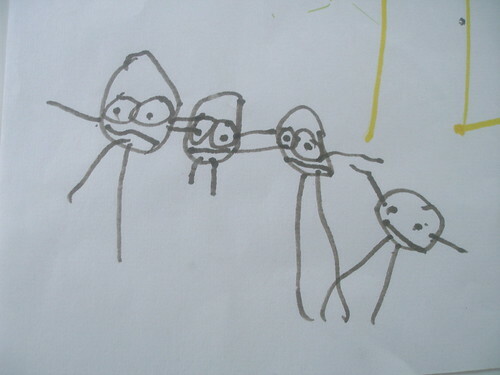 It’s funny when I look at this picture because I could probably pull an almost exact replica out of my stash of Emma’s early work. And I have to confess, poor second child that she is, I haven’t been saving much of Mary’s work. I feel like I’ve had this pathetic (internal) “yeah, yeah, I’ve seen those kind of drawing before. I’ll start saving them when they get better, kid!” kind of horrible attitude in my head. But no more. I’m cherishing these sweet little drawings. Let the collection begin. I have two things that I want to buy myself for my birthday. The first I got this morning–two sets of Moleskine journals–one set of thin notebook sized, the other a small pack of pocket-sized journals. In my old age, I find that I’m forgetting lots of things. I’ve always been a list-maker, a genetic trait I inherited from my mother. And I’ve been kind of ADD with my list notebook this year. I have about three going at the same time, I can usually only find one of them, which is the one I’m NOT looking for at the time. So I decided to consolidate into these moleskines, one-at-a-time. The small journals are to stash in my back pocket. I’ve gotten in the habit of jotting down writing ideas or stories on scrap pieces of paper–a receipt, a piece of the girls’ (probably Mary’s) artwork that been tossed aside. And then, I lose them. Of course. Or horror of horrors, send them down the library book return shoot. I had written a kind of personal, introspective note on a receipt, which I then tucked in the book I was reading and literally had to dive in after it up to my shoulder, as I saw the little tail of it slipping down the library book return. Phew. So I think keeping my thoughts in my back pocket is a bit safer. Hi Molly. I wanted to let you know that I got the dryer balls and they are great. Thank you so much!! And happy birthday to you! I love the new journals. sounds like a lovely day. happy 32! Happy Birthday!!!! I really enjoyed reading your “About Me” page and the drawing- It is just perfect! Happy birthday! The About Me page is great. Have you read any Mary Oliver? She goes well with Wendell Berry. i love those moleskines – they are addictive! Happy birthday! I love the About page– you gave US a gift on your birthday. I’m your senior by ten years. Just wanted to say that I admire your gentle and quiet spirit. You may not think you have it, but the Lord has a way of conveying it through you, in spite of you. It comes through so beautifully in your writing, which is why God gave you the desire and skill to be a writer, I’m sure. All for his glory. Happy Birthday! So glad you will have more children. The more the merrier. At 42, I’m carrying my fourth. Happy Birthday! May all of your birthday wishes come true!! happy birthday you young thing…coming from an “old” 35 year old! it was so fun to read your “about” page- you are delightful in every way! Happiest Birthday, Mollie! 32 is a good year!!! Alone time–what a great birthday gift! Love the drawing, the moleskins, the new header (amazing! ), and the About page! Thanks for sharing! I hope this is a great 32nd year for you. happy b-day name twin and almost birthday twin! you’ve got six days on me. love the present you bought yourself! molly! hope you had a great birthday! i love mary’s drawing – think about embroidering it, ok? happy birthday friend! (let’s have cake at our next visit? i’ll bake. what’s your flavor?) love the new look. love the about page – so fun to read all of that. i got goosebumps when i read about you and dan meeting. and lists! (they’re all over blogland right now, it seems.) love the moleskines. that’s where all of my lists are. Hi Molly!I stumbled across your blog after reading your Momformation posts. I like your style and just wanted to say hello! Happy Birthday, I am glad you had a nice day! Wow! Your Home page looks great! Very enticing. Happy belated birthday. I love your new photo header thingy! What a great picture. And I love your About Page. sounds like a very happy birthday to me. 32 is nice. i’m sure you’ll enjoy it! hope it was special-Happy Birthday! Happy birthday! I hope the year ahead will be your best ever and that you will fill those notebooks with tons of inspiration and ideas! Happy b-day. You’ve quickly become one of my favorite blogs! Hope you have a great b-day week! I do doodle in moleskines too… a large reporters notebook for work (as an Art Director), one for personal, one for ideas, and one for… it got confusing now I just have one at work and home. I still doodle on receipts but now I just tape them in the moleskine. I love the idea of your notebooks. I’m exactly the same when it comes to scribbling down thoughts and lists and all sort of things on bits of paper. Oh, and the library thing, looks like you’ve seen me do the exact same thing! I may have to take a page of your book and start carrying a notebook with me at all times. Happy Belated Birthdday Molly! 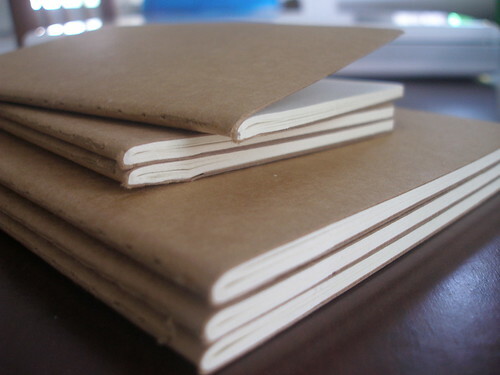 Moleskines! Great gift for yourself. I love my kraft colored ones too and made a special case to carry them all in one place. Your new header is amazing!